I run a buying club for local, GMO-free foods produced on clean, sustainable farms. This work often brings me to the farm. I was recently on a farm and reminded of why I do the work I do. The farm was quite busy. Everyone was focused on his or her tasks. The cheese maker was making cheese, the butcher was butchering, someone was in the office returning calls and someone else was bottling milk. I was helping here and there while the farmer’s 1-1/2 year old son kept us all smiling and cooing. It is both hard work and rewarding to be part of this process. A busy morning on the farm doesn’t offer a lot of time for quiet reflection, but I can’t help but notice the small details. 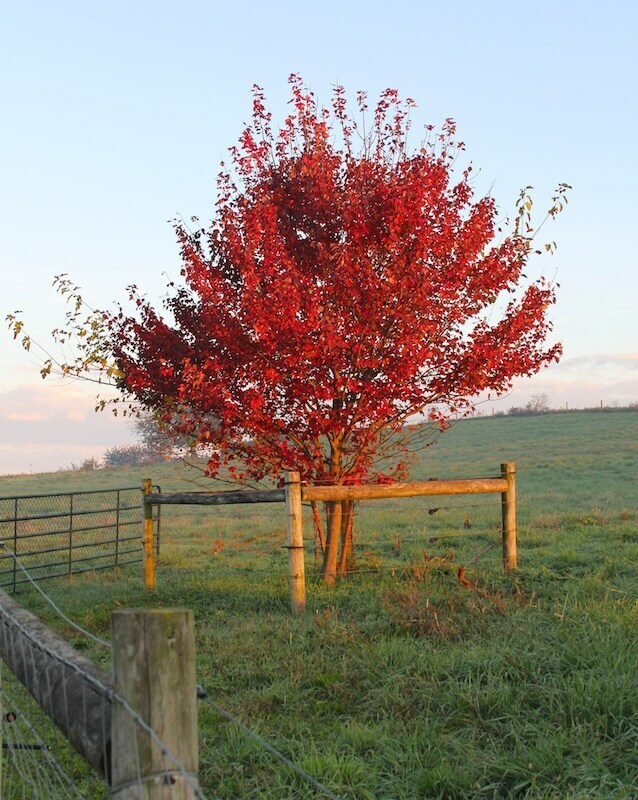 There is a tree right by the barn that glows a vibrant red in the morning autumn light. There is a little white and spotted kitten that plays right in front of the door and greets each person with a happy meow. She is there, every morning. There is a light fog that hangs over the fields. 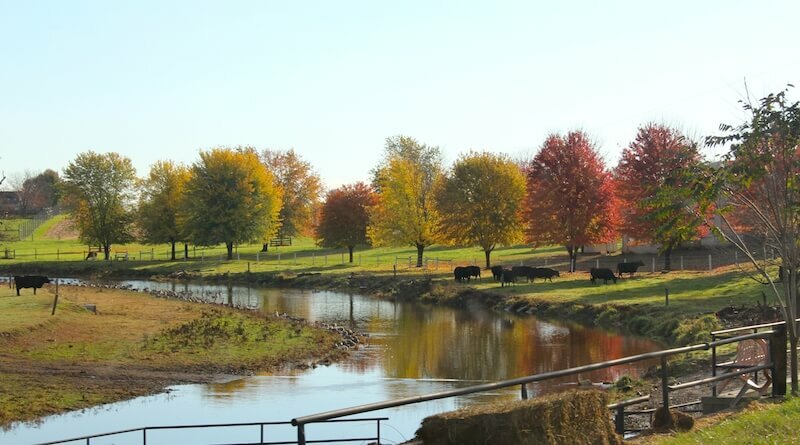 This is the scene that greeted me last as I pulled up to the farm. As always, I was greeted with several cheery voices wishing me a good morning, and expressing what a beautiful day it was, accompanied by genuine smiles. Indeed it was a beautiful day. It is these small things, and the people involved, that give farms character. As usual while working, nearby customers come to the farm to pick up food. I am always impressed with the way the farm treats everyone who gets their food. When I am working — sometimes lost in my own thoughts, sometimes in cheerful conversation with others — it gives me that little time to reflect. In the autumn, I tend to get a sense of the season and reflect more deeply on gratitude and value–how grateful I am to have the opportunity to work hard at work worth doing and how much I value that work. 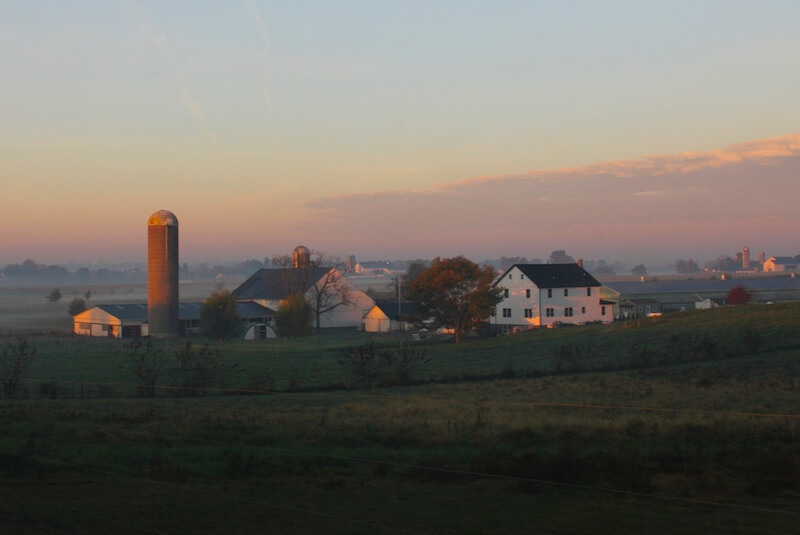 I am grateful that I regularly visit the farms I work with and see them in motion and the transparency that offers. I value that time and I value the confidence it gives me in giving feedback or endorsements of the farm. I am grateful that others have the same opportunity to visit so they know first hand how the farm operates and, most importantly, how committed the farmers are to transparency. Patrons can see that what they claim is what they practice–and they do so because they know the value in it. I am grateful to all those who contribute to this valuable and vital “new” system of food distribution. I am grateful to the farmers who make all this possible and for their expressions of gratitude for our involvement. It is a symbiotic relationship. I am grateful to each person who continue to support small farms, not because it is easy, but because it is the right thing to do. Our food system is a system that touches all others. I am never more aware of this than as I witness, participate in, and reflect on the process of how food reaches our tables. Indeed, many people are far removed from their food source and production at this point. I admire your resolve to engage again. Thank you for the kind words, Lorraine. I appreciate you sharing your memories from childhood. :) What a great experience. Sounds like a wonderful childhood that you have carried into your adult years. Farmers are truly dedicated. Animals do not know holidays or weekends. And people need to eat every day. I believe that we can go back to a way of life that honors the soils and cycles that allow us to thrive. I hope to see it in my lifetime and work towards it always for my children.